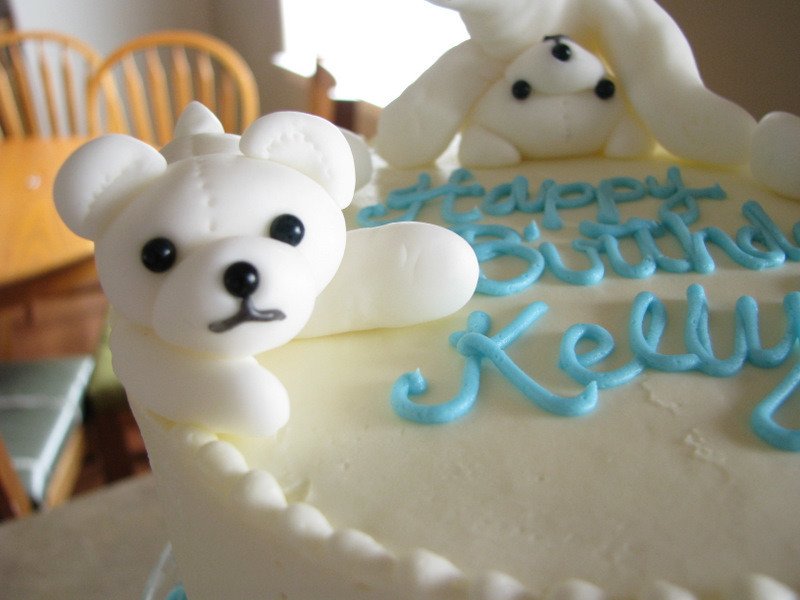 This cake requires some explanation and a little Kelly History lesson. 😀 When Kelly was about 18 months old, she discovered “White Baby”. 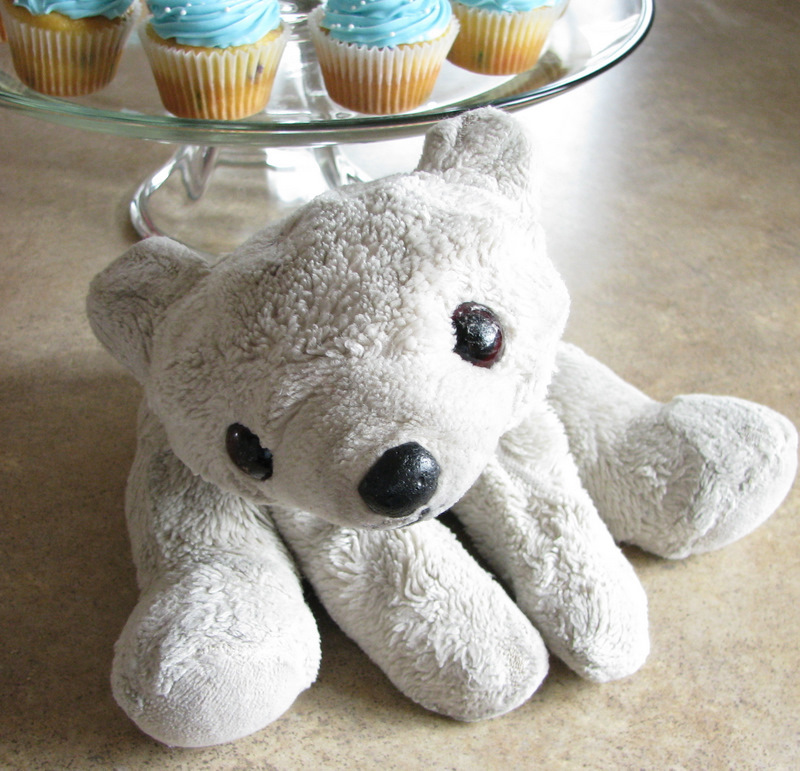 There were actually two babies– White Baby and Blue Baby– which were leftover jumbo beanie babies from the late 90s. She played with both, but White Baby became her favorite, and she couldn’t live without her. Isn’t that the cutest? I thought that was so sweet of Mike. Poor White Baby is looking pretty rough these days. She has a bad case of the mange. 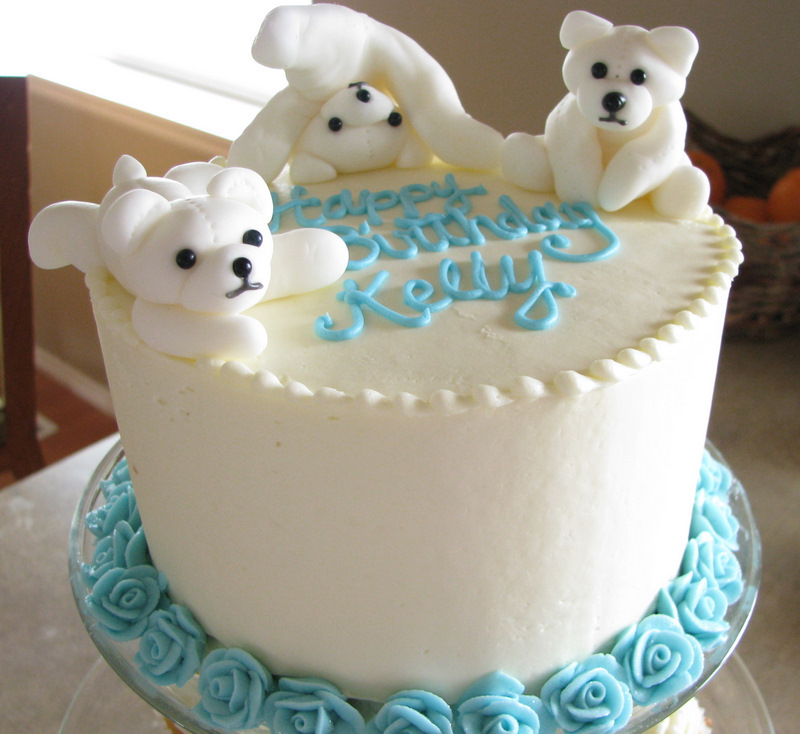 When Kelly told me that she wanted a “Stuffed Animal” themed cake this year, I thought it might be fun to do a White Baby cake for her. I’m not very experienced at fondant modeling, but I decided to give it a try. 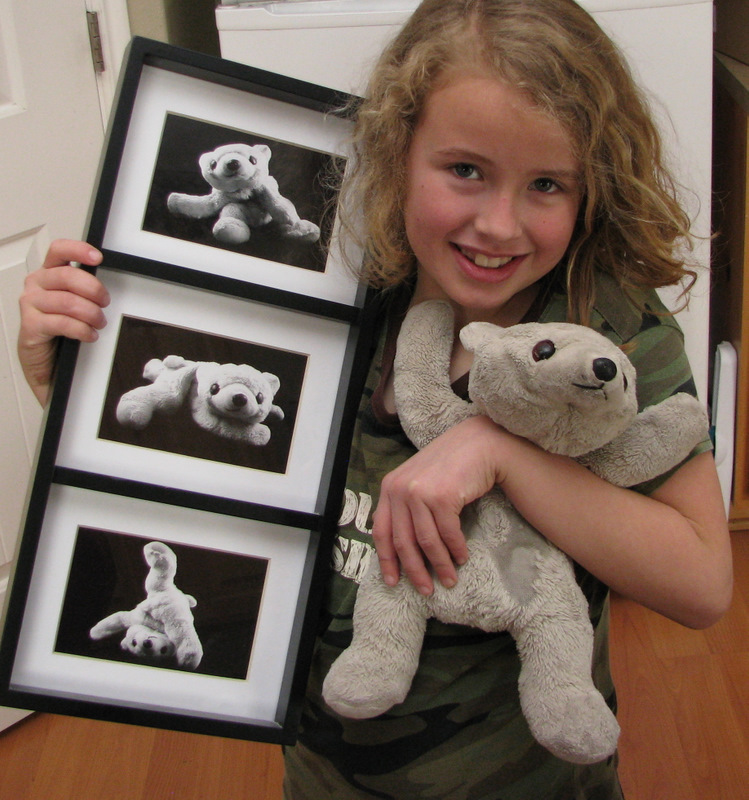 I did three figures, each one imitating the pictures in her photo montage. Probably a little too close-up, since you can see all of my mistakes! Oh well. 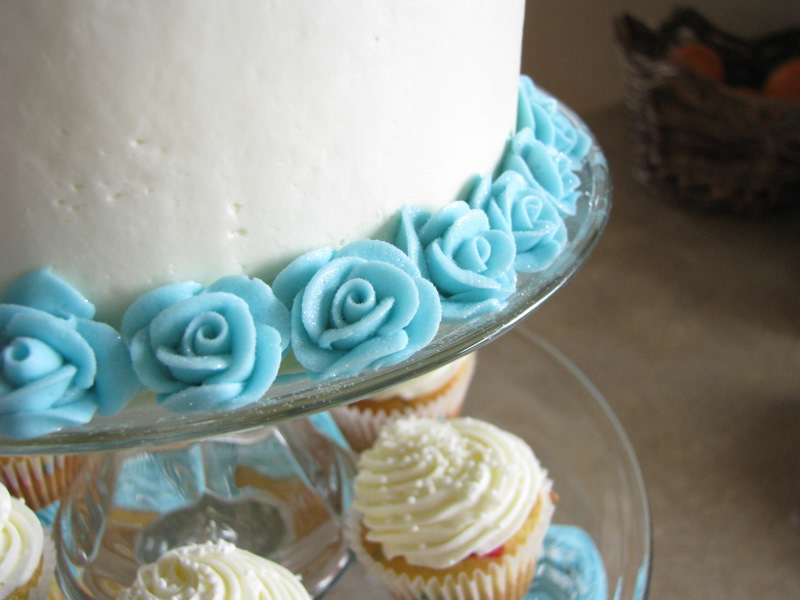 I have a favorite cake decorating buttercream that I’ve used for years, but I decided to try my newly discovered cupcake icing and see how it would do for cake decorating– borders, flowers, etc. It worked awesome! I did a border with tip 101 roses, and it worked beautifully for those. Kelly wanted lemon filling, so I flavored the frosting with 2 tsp. of lemon emulsion to go along with it, and it was so delicious! I will definitely be using that again and again. Mike commented yesterday about how presentation is everything. We were just doing a small party with our family and some cousins, so I didn’t want a huge cake, but I wanted it to look special. This whole thing was only one cake mix. 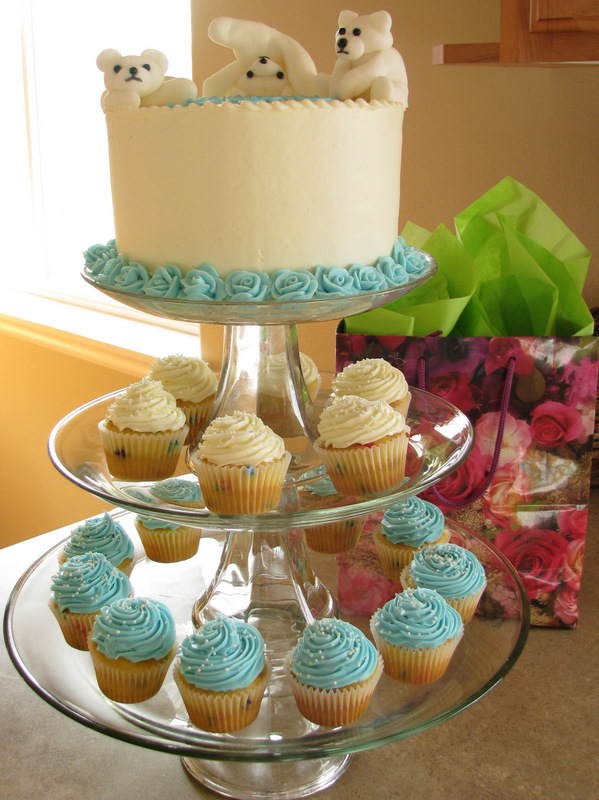 I did two 6-inch layers for the top cake, and used the rest of the batter to make mini cupcakes. That’s all pretty small stuff, but presented on a tiered cake stand, it looked a lot bigger and more exciting than it really was! Happy birthday to my Kelly! Kelly was very excited to pick the winning number this morning (and she also appreciated all of your birthday wishes!). And the winner is Pita from Dulce Decoracion in Spain. Congratulations, Pita! I sent you an email, but if you don’t see it, you can contact us with your mailing address at contact at karenscookies dot net. We had a happy birthday at our house. I didn’t make any cookies for the occasion (I think my kids are tired of cookies!) but I’ll post pictures of her cake soon. 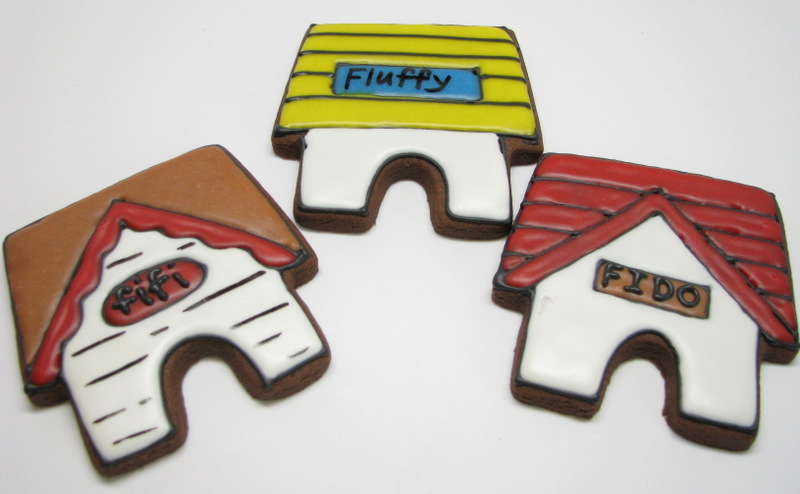 The winner of the Wilton Pet Cookie Cutter set is Thyjuan from Inspirations by Thyjuan. Congratulations Thyjuan! I’m sure you’ll put the cutters to good use! I’ve sent you an email, so you can respond to that with your mailing address, or if you don’t see it, send me an email at contact at karenscookies dot net. Today is Dr. Seuss’ birthday. I really wish I would have planned ahead and got some Green Eggs and Ham cookies done in honor of his birthday and Read Across America day. But alas…. I did not. So if you need some Dr. Seuss ideas, please go check out Sweet Sugarbelle’s site today. Please. I’ll wait for you to come back. Are you back? Weren’t they great? I especially love the cookie cupcake picks. I’m totally going to do that one of these days. I promise I’m almost done with this batch and then we can move on. 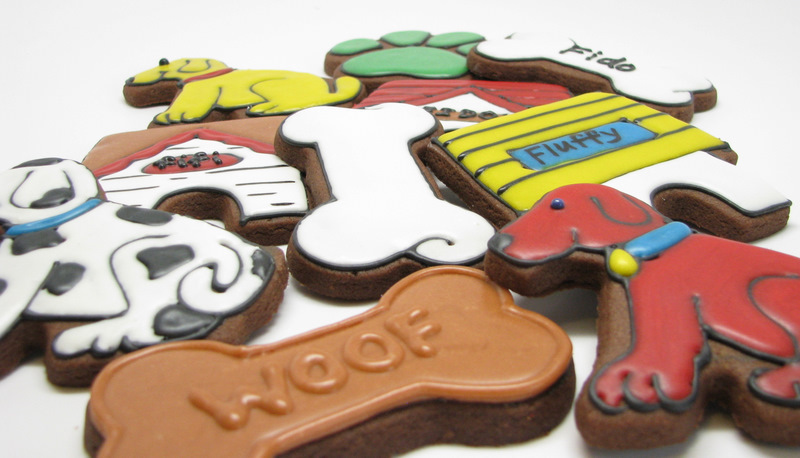 But first, we have the Wilton Pet Cookie Cutter Set. They call it a “Pet” set, but a more accurate description would probably be Dog or Puppy set. There are no cats, hamsters, fish or gerbils here. So if your pet happens to be a dog, then this will be a good fit. Actually, the paw could be a cat paw. But other than that, you’re going to need to get creative if you’re a cat lover. Green paws? I was trying to make some colorful choices– does the green paw work? Not sure. And I really wish I would have done the blue one with a darker blue. I was kind of going for the “sit down in my thinking chair and think. think. think.” look (if ya know what I mean… wink wink), but I missed the mark. Dark blue probably would have done it. There is a dog house cutter. I like that picture. But it doesn’t show the back ones very well. So here’s a more boring picture so you can see the details. 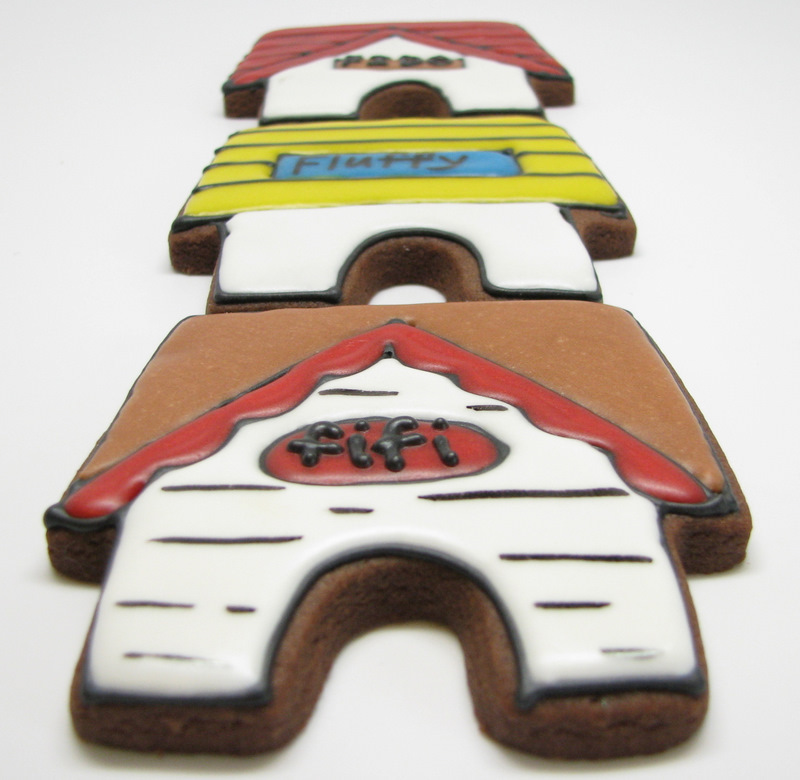 I used a Gourmet Writer to do the lines on the bottom left dog house, and to write “Fluffy” on the top one. I generally like piping better than gourmet writers for writing, but I did really like how the lines on Fifi’s house came out. That’s where I really like the edible markers– with accent lines, wood grain, stitching, etc. 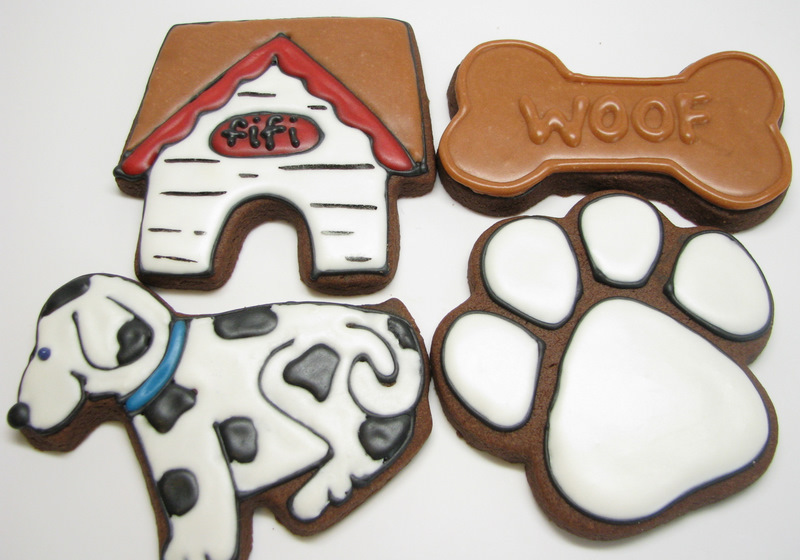 Which would be great for making actual doggie treats for your dog. I don’t have a recipe to share, but if you do a google search, you’ll find tons. 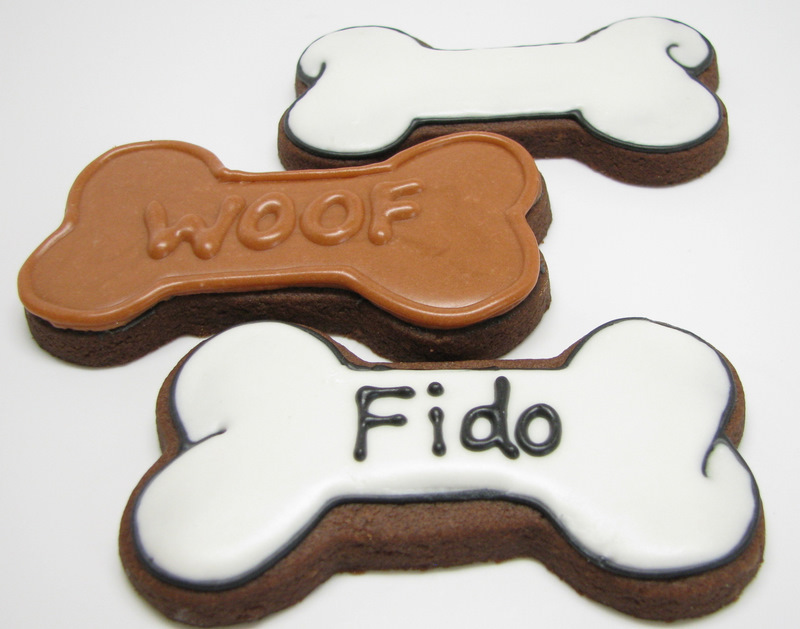 I don’t have a dog, so I didn’t want to whip up a batch of doggie treats. I think I’d really have to love a dog to do that. And last, but not least, the doggie. Woof! 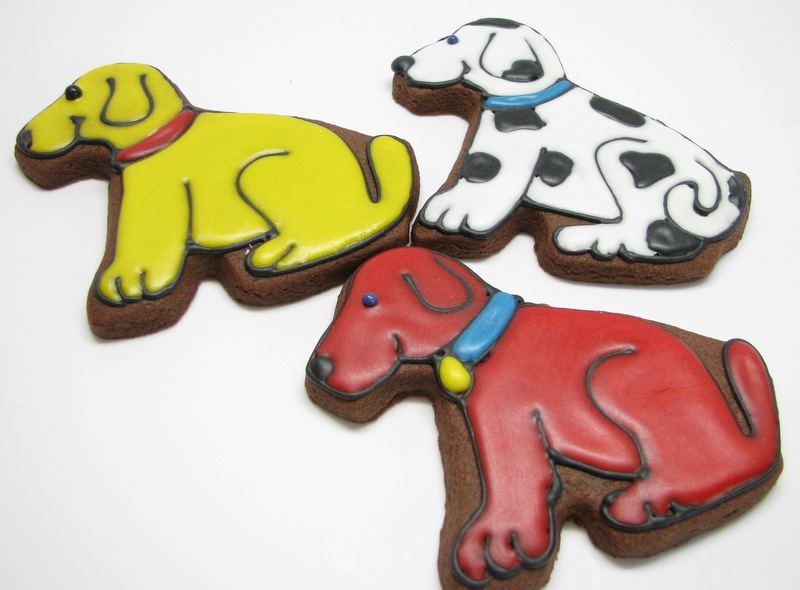 Again– trying to add some color to the dogs, so I used red and yellow. Definitely not realistic, but kind of cute anyway. 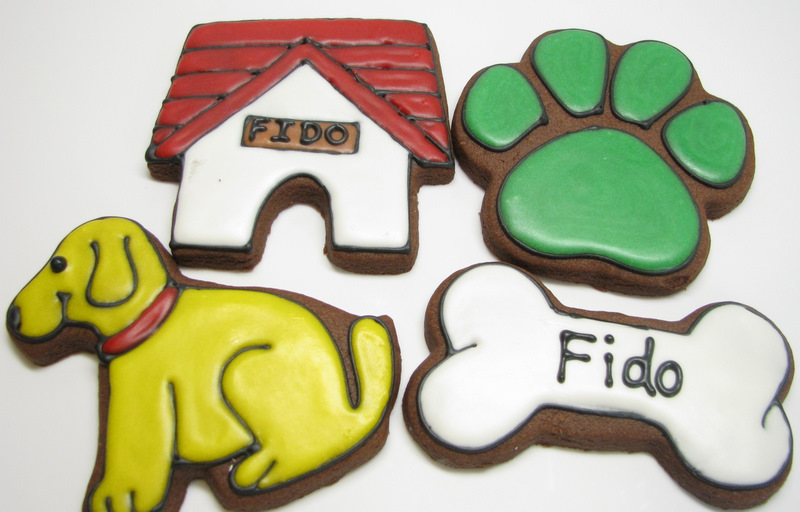 Do you want a set of Pet Cookie Cutters? Comment on this post by Thursday, March 3, at midnight, and I’ll choose a winner using Random.org. 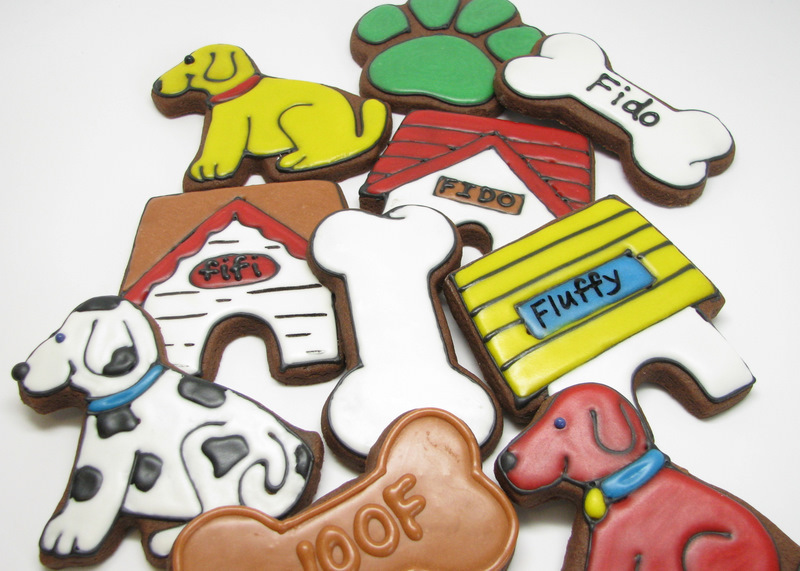 I’ll send the winner a set of the Wilton Pet cookie cutters. 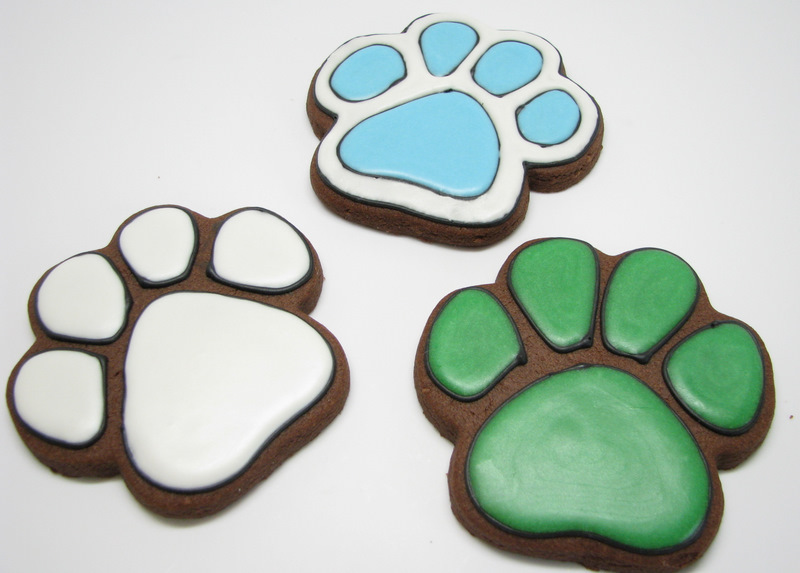 Your pony cookies are fabulous and the eyes on the blue bear are my favorite too. I wish I had just half of your talent. Aww, thanks Donna! And thanks for liking my rocking horses, too. 🙂 I’ve sent you an email, so just respond to that, or send us an email at contact at karenscookies dot net. Thanks once again to all who entered! I appreciate all the great comments! A few people asked what kind of frosting I used on these. I always forget to say that! These (and all of my recent posts) were done with Meringue Powder Buttercream. I use that almost exclusively, so if I ever forget to specify which frosting I used, you can bet that it’s MPB. Since I use the others a lot less often, I’ll be sure to say when I’m using something else. The recipe is on my web site, but I should probably get it here on the blog, so here it is, with a few notations that might be helpful. Note: Don’t skimp on the whipping time after adding the shortening. You really need to whip it well to prevent separation later. *If egg whites are the first ingredient on your meringue powder, you can use the smaller amount. If egg whites come later in the ingredient list, or if you live in a very high humidity area, I recommend using 4 T. You can also add a tablespoon of pure dried egg whites along with your meringue powder to give it extra drying power. **I recommend Crisco shortening, because it has the most consistent results. There are some store brands that will work, but some do not (they cause ugly separation when you thin it down for glaze), so just to be safe, I recommend only using Crisco brand. If you have an aversion to using shortening, I completely understand, and you can use butter instead– however, I have had mixed results using butter. The first few times I used butter, it worked beautifully, and then the next couple of times, it separated and didn’t dry well. I have no idea what made the difference. So anyway, if you use butter, be aware that there may be some separation issues if you thin it down for glaze, and you also might need to add a little extra powdered sugar because it’s quite a lot softer when using butter. Also, if you find you have trouble with your MPB drying, you can cut down the shortening to as much as half (so use 1/4 cup per batch) and it will help it to dry faster and more thoroughly. ***I really recommend weighing the powdered sugar if at all possible. Powdered sugar is a bugger to measure. It seems like it varies SO much. If you don’t have a scale, stir or sift your powdered sugar before measuring to make sure it’s light and fluffy. 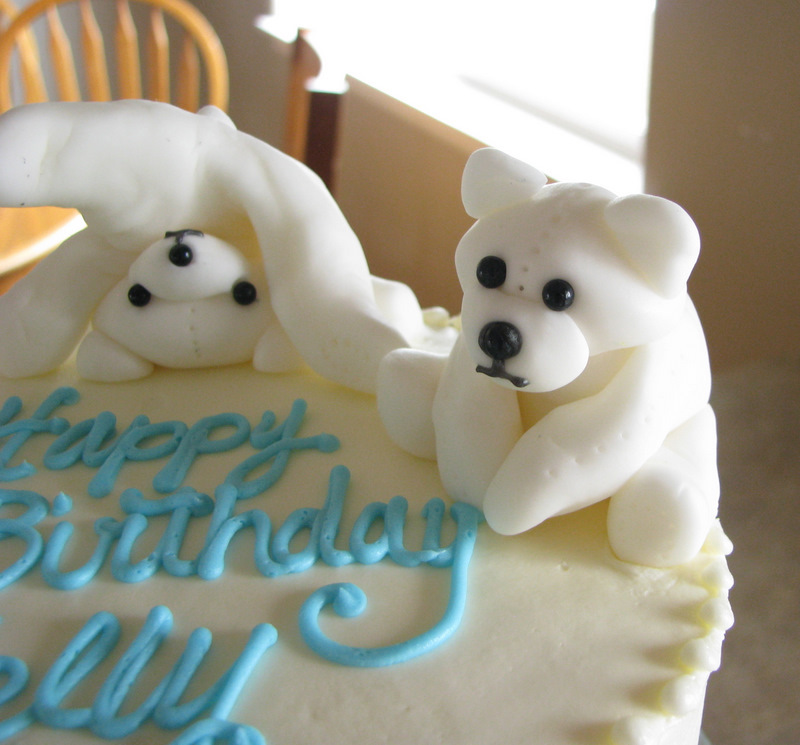 If you do everything exactly “right”, and your frosting still comes out way too stiff or way too soft, never fear! It is a very forgiving medium! Feel free to add water to make it softer, or add powdered sugar to stiffen it up. It won’t ruin anything!